﻿﻿﻿﻿﻿﻿﻿﻿﻿﻿﻿﻿﻿﻿﻿﻿﻿﻿﻿﻿﻿﻿﻿﻿﻿﻿﻿﻿﻿﻿﻿﻿﻿﻿﻿﻿﻿﻿﻿﻿﻿﻿﻿﻿The automatic translation is necessarily imprecise. This translation does not replace the reading of German or English original texts. The Auzon Runic Casket, a carving made of whalebone, counts among the most outstanding objects from Anglo-Saxon days. After a long and obscure history it is now exhibited in the British Museum in London, named after its donor 'Franks Casket'. It was made in the 1st half of the 7th century somewhere in the North of England, most likely in Northumbria. With its pictures taken from most different sources it is a testimony of a syncretistic era, the transition period from Germanic paganism to Christianity. Inspired by the new religion is the choice of some of the pictures and, in particular, the way of scenic depiction. Rather of pagan nature is the attempt to work magic with the help of pictures and runes, i.e. inscriptions, numbers and values. With the sequence of pictures the rune-master has developed a programme, designed to protect his client's way of life (wyrd) from birth to death and beyond. This programme starts - from right to left - on the front (F-Panel) with the picture of the Magi and continues with the depiction of the mythical smith, Welund. The inscription on this panel, the verses on the whale, does not seem to relate to the images, not at the first glance, at least. The left side (R-Panel) continues with the depiction of the Roman dioscuri, Romulus and Remus. Here the runic inscription comments dírectly on the scene. The back (T-Panel)shows the conquest of Jerusalem (70 A. D.) by Titus. This scene, too, is explained by the text on the edges, but after a first line, Anglo-Saxon words kept in runes, it changes into a text, mainly Latin in word and letter, the cryptogram of a Metonic Cycle . The programme continues on the right side (H-Panel) with a dramatic scene, the death of a hero, derived from Germanic mythology, commented on in runic cryptography. The sequence of pictures ends with the image of an archer Ægil on the lid (Æ-Panel). Actually, it depicts the Circle of the Year, understood as the fight for he Sun carried out by the Frost Giants versus the Æsir, basing on the mysterious 432.000 which make an Aeon. The runic texts seem to be meant to explain the pictures. But summing it all up the Conclusion shows that not only runes, but also their number and value are part of rune magic which is meant as a support to picture magic. The mathematical structure of all inscriptions and the interaction of pictures and runes can be proved, i.e. they are not just casual. Actually, while the number of runes seems to aim at a "solar" total, their value reflects their "lunar" equivalent, with both calendars harmonized by cycles of 8 and 19 years. This may be to keep the spell working. In further "supplements" annotations etc. may follow. 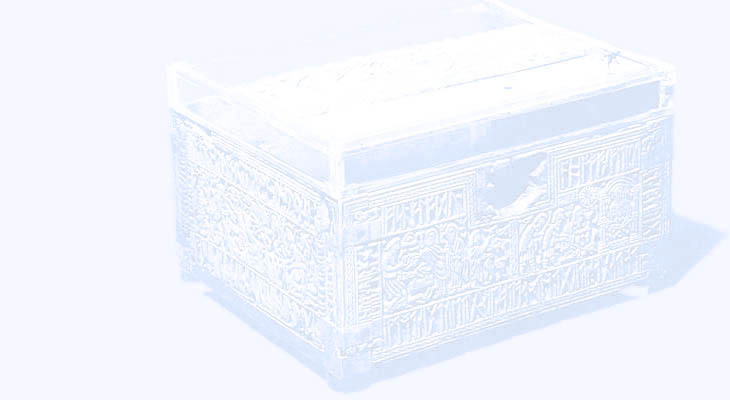 - Programme: Ecclesiastical Reliquary or Royal Hoard Box? - The Casket, a Warrior's Life? - Szabo, "Bad to the Bone?" - Stone, "The Knots of Death"
(Regensburger Arbeiten zur Anglistik und Amerikanistik, Bd. 5), Regensburg 1973; 306 S.